Elizabeth Connor, Wellington, plans to use the prize to help change New Zealander’s attitudes to science and encourage a greater understanding of the contribution science makes to the country. The 26-year-old studied physics and maths at Victoria University of Wellington, completing an Honours degree in physics in 2005, and going on to gain a Masters in Science Communication from London’s Imperial College. She has worked on research projects through the MacDiarmid Institute for Advanced Materials and Nanotechnology where she also started her science communication career. She has written a series of success stories on MacDiarmid researchers, a book ‘Tools for Transformation’ on the institute’s equipment and transforming research relationships, and has produced a case study on Canterbury’s BlueFern supercomputing centre. Elizabeth attributes her science communication career choice to Professor Sir Paul Callaghan, founding director of the MacDiarmid Institute, who advised her to pursue what she was good at and encouraged her into journalism. “Science, to Elizabeth, is a great adventure,” said Professor Callaghan, who supported her bid for the Prime Minister’s prize. 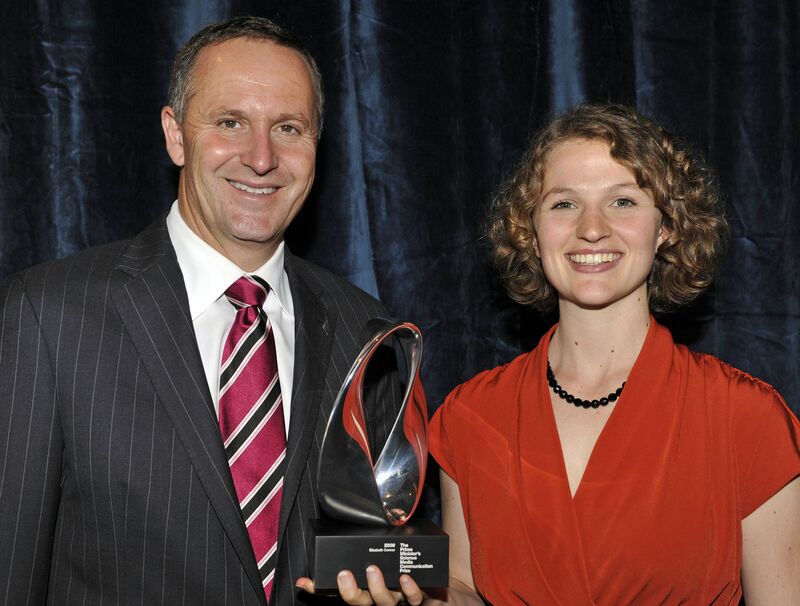 Elizabeth says she will use her prize-winning opportunity to help raise awareness of the value of science to New Zealand culture and economy and increase connections and collaborations between scientists, policy makers, entrepreneurs and ordinary New Zealanders. “I want to focus on the intrigue and uncertainty of science. Science is often considered as the source of all answers, but science is full of mystery – there is so much we don’t know. I want to inspire people with the same sense of wonder that drives scientists.